Ugh, we're in the middle of one of the realities of spring here in New York: rain. So. Much. Rain. We've been a bit spoiled with sunshine these past few weeks, so I probably shouldn't complain too much. One good thing that comes out of weather like this? Creativity! Yesterday, one of those days where you could only see 15 blocks uptown instead of 70, Gina and I ventured out to run a couple errands, and I was aching to try a DIY jewelry project I saw on this blog. (The whole thing is so cute, by the way, lots of great projects and fashion inspiration.) We trudged up to Home Depot, and eventually found the aisle brimming with ropes, cords, lug nuts and nails. I didn't want to get too ahead of myself in case the results turned out to be sort of lame, so I selected a few bags of tiny gold hex nuts and a roll of neon pink cord. 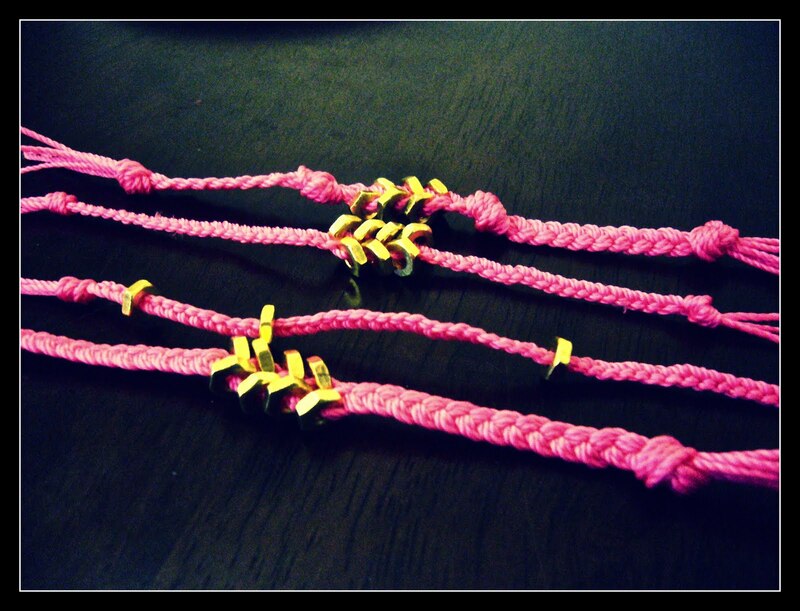 Once I got started braiding, looping and knotting, I couldn't stop. I tried and re-tried some different techniques (thank you, 10 years of summer camp friendship bracelets) and eventually created some bracelets I really love! So for this first one, I just did a simple braid, but instead of using just three strands, I doubled up and used six. This created a thicker, stronger band, and held the hex nuts in place perfectly. 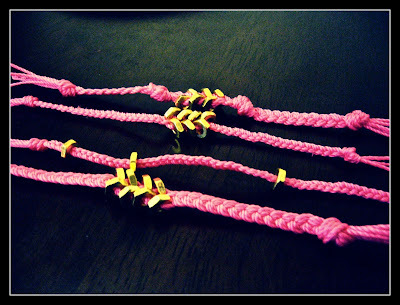 I pulled two strings through each one, then just braided normally while pulling very tightly. One thing to know about me is that when I feel crafty, I feel really crafty. 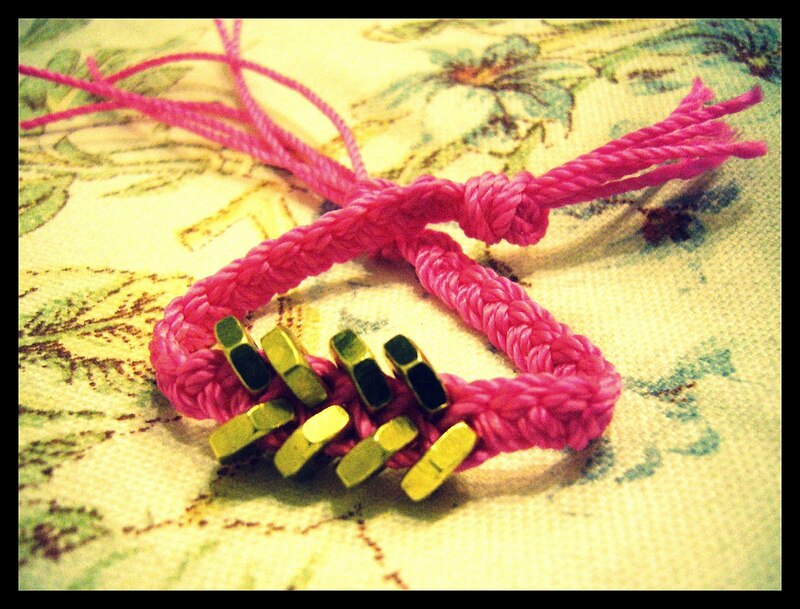 Making one Valentine card becomes 50, and making one bracelet became four. I now feel an uncontrolable urge to go back to Home Depot and buy some more cord (Yellow! Orange!) and perhaps some silver hex nuts too, and just go to town. I have a feeling the hardware store cold become a wealth of inspiration! These little treats will make excellent gifts and be perfect to mix and match for some added zest in my summer wardrobe. *I think you can find these supplies at any hardware store. The cord was about $5, and the bags of 8 hex nuts are about $1.20 each. (Keep in mind these could also be inflated NYC prices, so you might be able to try this for even less! love love those gold hex nuts! I have TON of orange and yellow left over from when I did this DIY - if you want it, it's yours! This is a super-cute idea! Can't wait to try it. It would be a great project for older kids/teens as well. JUST LOVED IT, BUT HOW DO YOU CONNECT THE ENDS? How much do they weight? How about my cervical? LOVE IT! I cant wait to do this this weekend.